First a disclosure for all the disclosure enthusiasts who hound me here and on Twitter to disclose things that are well known to most readers in hopes of turning this blog into a legal document: USV is a large investor in Coinbase and I am on the Board of Coinbase. Ok, now that we have done that part, here’s the news that came out yesterday and I want to talk about today. 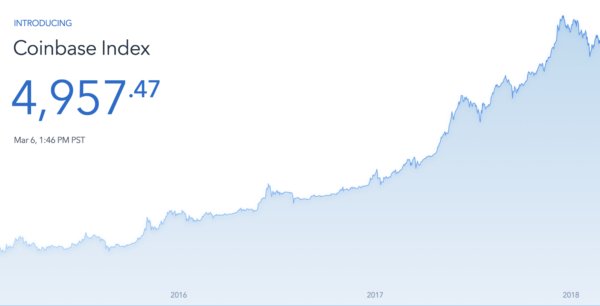 The Coinbase Index is a measure of the financial performance of all assets listed on Coinbase’s GDAX exchange, weighted by their market capitalization. And the Coinbase Index Fund is a way to buy that index without having to buy the individual assets that make up the index. This blog post has more details on both. To start, the Coinbase Index Fund will only be available to US-resident, accredited investors. Coinbase is actively working on launching more funds which will be available to all investors and cover a broader range of digital assets. To me, this is all about broadening the appeal of crypto tokens to a wider range of investors than are currently in the market. Making it simple for the average investor to get exposure to this emerging sector is a good thing and I am pleased that Coinbase is broadening its offerings to reach people it is currently not serving.